The spring 2010 issue, No 7, of Boyne Berries magazine is almost ready for the printers. We arrange everything and present the printers with a pdf. Two proofs are checked for typos and mistakes and then the magazine is printed. We hold a launch in Trim at which contributors are invited to read their pieces. We try to have a well known figure to perform the launch. These have included local Minister Noel Dempsey, poet and publisher Peter Fallon and novelist Noelle Harrison. The magazine began as a response to our group's desire to see their work in print. We decided that instead of publishing a collection of our own work we would invite submissions, prose and poetry, and publish a selection of these with some of our own work. We put out calls for submissions on the internet and got a substantial number. We have got some funding from Meath Arts Office twice but none recently. We also got a donation towards printing costs from a Trim resident with an interest in writing. Apart from that the magazine is funded by sales and by our own funds - members' weekly contributions. We look on Boyne Berries as an important addition to the range of magazines publishing poetry and prose in Ireland and we especially like to encourage those who may not have been published before. Issue 7 of Boyne Berries should be ready by the end of March. A provisional launch date has been fixed for Thursday March 25 but this has still to be confirmed. Submissions for Issue 8 and 9 will be opened later this year. Thank you for your submission to the Poetry Ireland Introductions series 2010. I regret to say you have been unsuccessful this year. As always, we have received a large volume of applicants for a limited number of places. The choice by an independent judge was based on the quality of the work alongside a proven record of publication in recognised journals. I hope this will not deter you from applying again. Please note that successful applicants have often applied a number of times before being included in the series. Wishing you well in your work and your writing. Many competitions don't inform the unsuccessful entrants and some don't put their results on the internet. Trust Poetry Ireland to do it well. I don't know who has been successful except for Peter Goulding who is a good friend of Boyne Writers and who has mentioned it in his blog. Well done Peter! Only one competition left to tie up from 2009, the WOW Awards. Shortlist in the next few days according to the website. Eugene Lambert the puppeteer and ventriloquist has died aged 82. Eugene was a native of Sligo and is best known for the children's television series Wanderly Wagon which ran from 1967 to 1982. 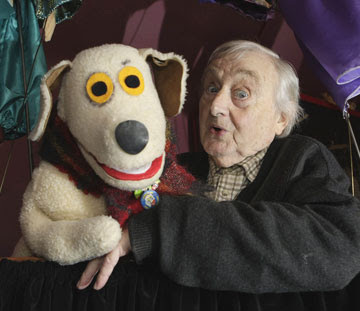 He founded the Lambert Puppet Theatre in Monkstown, Co Dublin in 1972. Our children came along towards the end of Wanderly Wagon and have fond memories of the series. They were also taken on a number of occasions to the Puppet Theatre. I also took school groups on outings there. A feature of most shows I attended there was that Eugene did a spot there with his well known dog Judge. Judge was famous for his part in the Safe Cross Code advertisement. I first saw Eugene Lambert and Judge perform at a concert or play in Skreen Hall in his (and my) native county Sligo sometime in the very early 1960s when I was visiting my grandparents. I have few memories of the event. I don't think it was the same time as some of the audience at the back showed their disinterest in the fare on offer by bleating like sheep. Eugene was one of those people who worked at something he loved all his life and left the country richer as a result. A great view of the audience and readers at the Readings and Open Mic last week. Featured poet Susan Connolly is seated second from right and Michael Sheils, the other featured writer, is third from left. The Observer yesterday published advice from a number of writers who were asked to submit 10 rules for writing fiction. The advice submitted included some very detailed, some very concise and some flippant efforts. I love reading this kind of thing but find them completely useless as advice. Great to justify any particular stance you wish to adopt and argue about at the moment though. In general the best advice is get on with it. If you want to write, write. Margaret Atwood's advice is great: You most likely need a thesaurus, a rudimentary grammar book, and a grip on reality. This latter means: there's no free lunch. Writing is work. It's also gambling. You don't get a pension plan. Other people can help you a bit, but ­essentially you're on your own. ­Nobody is making you do this: you chose it, so don't whine. A few refused to provide ten rules. Helen Simpson wrote: The nearest I have to a rule is a Post-it on the wall in front of my desk saying "Faire et se taire" (Flaubert), which I translate for myself as "Shut up and get on with it." Colm Tobin's: If you have to read, to cheer yourself up read biographies of writers who went insane. Anne Enright: Only bad writers think that their work is really good. Roddy Doyle: Do keep a thesaurus, but in the shed at the back of the garden or behind the fridge, somewhere that demands travel or effort. Chances are the words that come into your head will do fine, eg "horse", "ran", "said". Poet Andrew Motion's Rule no. 10 is Work hard. We held the first Boyne Reading and Open Mic of 2010 last Thursday night in our usual venue, the Village Hall, Knightsbridge, Trim. I couldn't attend being away at a family wedding in Kerry. By all accounts the night went very well with eighteen attending on what was a very cold frosty night. Susan Connolly, poet from Drogheda read of Banshees and window cleaners, and friendships, and the Maiden Tower according to poet Frank Murphy who attended and commented on his blog. 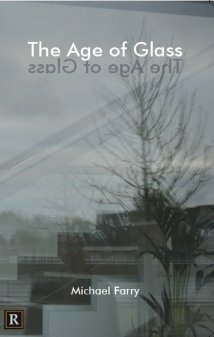 Boyne Writers Group member Orla Fay has a review of the evening and a photo on her blog. Susan was very impressed with the venue and with the tea and delicious biscuits. She sold some of her latest collection Forest Music. The other featured reader was Navan man Michael Sheils who goes by the nickname The Sheriff. His blog is here. His reading was also very well received. He is a regular at the open mic and there is a running joke between him and the MC Paddy. Paddy has a bell and a whistle to call to order those who overrun their time. He usually has to use it on the sheriff to the amusement of the audience. More than ten readers took part in the open mic including some who had travelled all the way from Cavan. Thanks to them and to all the members of Boyne Writers Group and Meath Writers Circle who continue to support this venture. 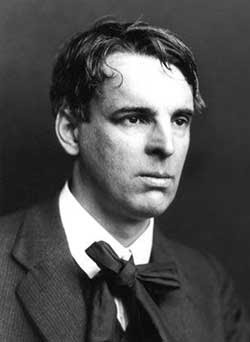 If you are asked to give a talk to Leaving Cert students about W.B.Yeats what do you say? The students have studied the selection of Yeats' poems on the curriculum so it doesn't make sense to just go through those again. Faced with this enjoyable task recently - well I would be Among School Children, a sort of sixty-year-old smiling public man- I decided as a starting point to discuss Yeats as a professional poet, a person who at a young age decided to become a poet. I talked about what he decided he needed to become a great poet. First he needed a place and he found this in Sligo or his version of Sligo which became his magical place, the source of much of his mythology though his connection with Sligo was quite tenuous. He needed a people to belong to and chose the Anglo-Irish aristocracy as a contrast to the middle class greasy till people then in the ascendant in the country. 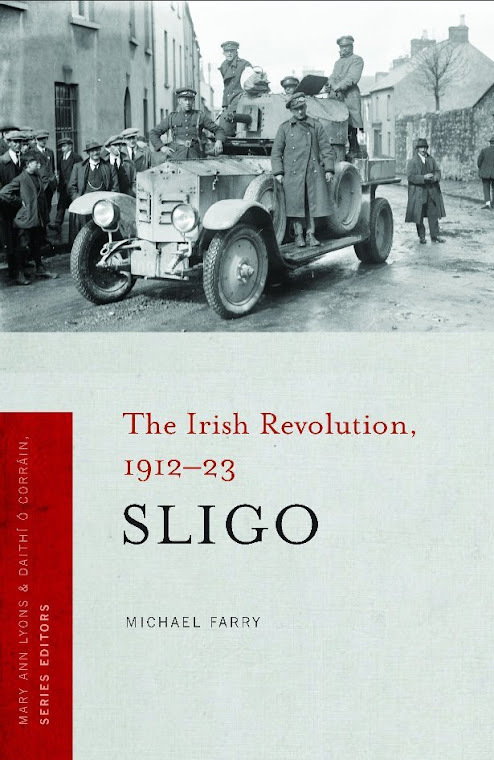 His own antecedents especially in Sligo belonged firmly to the merchant, money making classes. He needed a great unrequited love and found that in Maud Gonne. This proved a good framework to hang many references to the poems and to point out similarities in many of them. Asked what was their favourite Years poem they weren't very forthcoming so I asked which was the least favourite and got Sailing to Byzantium as the answer. Understandable since it is a poem of a disillusioned old man. That is no country for old men. The other featured reader at the Boyne Readings and Open Mic on Thursday February 18, at 8pm is well known Navan writer Michael Sheils. 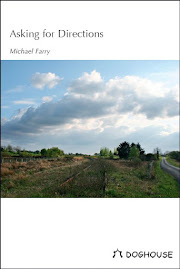 Michael has published a book, Short Trousers Days in Navan. He left school in 1962 at the age of 13 without doing the Primary Cert. At 49, he returned to learning with the Meath VEC Adult Literacy Scheme, two hours per week, and since then has sat the Junior Cert and the Leaving Cert. While studying for the Junior Cert, his tutor, Marie Condon, suggested to him that he should join the Meath Writers Circle. As a member of the Circle he discovered that he liked to write. He self-published his book in November 2005. He has since written a number of short stories and poems. A retired miner, Michael is popularly known as Sheriff and has been a regular at the Boyne Readings and Open Mic. His blog is here. The event takes place in The Village Hall, Knightsbridge Village, Longwood Road, Trim. Each night features two well known writers who read from their work. This is followed by an open mic session where everyone is welcome to read their own work. Just come along on the night and sign in. Admission 5 euro, Tea/Coffee, Biscuits. Our Boyne Readings and Open Mic starts again after the Christmas break on Thursday February 18, at 8pm. These take place monthly on the third Thursday in The Village Hall, Knightsbridge Village, Longwood Road, Trim. The featured readers this month are Susan Connolly and Michael Sheils. Susan Connolly was born in Drogheda, Co. Louth in 1956. 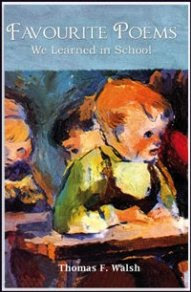 Her principal poetry collections include For the Stranger (Dublin, Dedalus Press,1993); and, with Anne-Marie Moroney, Stone and Tree Sheltering Water: An Exploration of Sacred and Secular Wells in Co. Louth (Flax Mill, 1998). Other short collections include How High the Moon (Poetry Ireland/Co-operation North 1991); Race to the Sea (Flax Mill, 1999); Ogham: Ancestors Remembered in Stone (Flax Mill, 2000); A Salmon in the Pool (Tearmann, 2001), a literary and placenames map of the river Boyne from source to sea. Her most recent collection of poetry is Forest Music (2009). 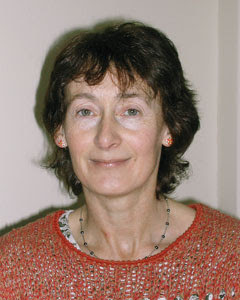 She was awarded the Patrick and Katherine Kavanagh Fellowship in Poetry in 2001. For some unknown reason Love is often associated with Poetry (or is it the other way round?). Anyway tomorrow being Valentine's Day here are a few links to selections of poems deemed suitable for the day. On Poetry Foundation they have a feature where Contemporary (American) Poets Pick Their Favorite Love Poems. Many unknown to me but nice to see William Butler Yeats included thought not for the expected Cloths of Heaven but for his When You Are Old. The Poetry Foundation.org website also has a selection of love poetry under various headings such as Classic Love, Romantic Love, Teen Love, Funny Love, Sad Love etc. In case you need to write a love poem yourself the site has an article on how to write love poems. 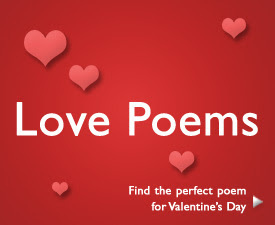 The Poets.org site, also American, has small poetry Valentines you can send as attachments with yout Valentine emails. There's also the Poemflow Valentines which apparently you can personalise and send to your loved one. The Americans do these sort of thing so much better/worse than the rest of us don't they! The latest issue of the American magazine Poetry has just arrived. This is a favourite of mine, not so big that you can't have the last issue finished by the time the next arrives. It usually has a nice mix of new poetry, often including translations, reviews and prose writing on poetry. This issue for instance has a long article entitled Why Live Without Writing - Unpopular answers to poetry questions by German poet Durs Grünbein. The article is translated by Michael Hoffman and is an extract from a forthcoming book of essays by Grunbein. The article - over 18 pages long - is an entertaining consideration of the reasons which drives a person to write based on what he regards as the three most common questions asked of a poet: 1. Can you really live off it? 2. How long have you been writing? 3. Why do you write? 1. You write to escape your dread of the sheer present. 2. You write because you can’t quite shake the suspicion that as a mere contemporary and biological cell mate, hopelessly trammeled up in your own limited lifespan, you would always remain incomplete, half a man, so to speak. 3. You write because the brain is an endless wilderness, whose roughest terrain can only be traveled with a pencil. 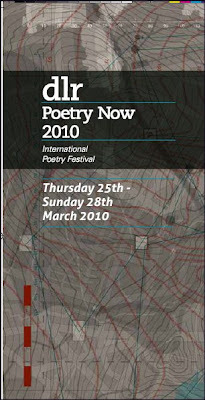 The programme for the Dun Laoghaire Poetry Now Festival 2010, 25 to 28 March, has been published and is available on the website. As usual a great selection of poets from Ireland, the UK, Europe and the rest of the world. Highlights should include the keynote address by Paul Muldoon, his own reading later in the week, readings by Irish poets Derek Mahon, Vona Groarke, T.S. Eliot prizewinner Philip Gross, Albanian poet Luljeta Lleshanaku and Homero Aridjis from Mexic0. Usually one of the highlights of the Irish poetry year, all the details are on the website. Labels: Dun Laoghaire Poetry Now Festival 2010; Paul Muldoon; Vona Groarke; Derek Mahon; Philip Gross. Just back after a visit to Manchester to see Manchester United play and easily defeat Portsmouth and go tops in the Premiership. My first visit ever in spite of being a fan since 1958. Great experience, very enjoyable. We booked the date because it suited a family event and were amazed to realise when we arrived at the stadium that it was the exact date of the Munich disaster fifty two years ago. This was only the sixth time that the team had played a match at Old Trafford on the exact date of the crash. 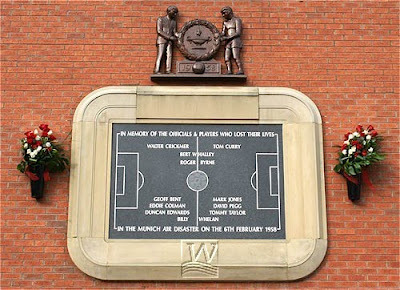 Supporters held a commemoration at the Munich memorial (above) and there was a minute silence before the match. We were high in the East Stand and had a great view especially of the three goals at our end in the second half. Quite a lot of Irish accents around and many on the flights over and back. We stayed in the Palace Hotel, right beside the Oxford Road railway station, one stop from Old Trafford. Very nice hotel, Brendan Shine is playing a concert there on March 10th. Tickets here! Great atmosphere in the stadium and all kinds of drama being played out, not just on the field. Great numbers of supporters are wearing green and gold scarves as a protest againt the current owner of the club, Malcolm Grazer. The green and gold were the colours of Newton Heath, the club which was renamed Manchester United many years ago. Enthusiastic chants of "Love United, Hate Glazer" also featured. The great cheer which greeted the Manchester City full time score (lost to Hull) also pointed to the great city rivalry and the recent efforts by City to compete with United. A really enjoyable visit, didn't see much of Manchester, just lots of red brick building and lots of canals. Maybe the next time I'll stay longer. Must remember to enter the Manchester Cathedral Poetry competition - collecting my prize would be a good excuse!! Last week myself and Paddy, another member of our Writers' Group, offered our services to a local retirement home as voluntary poetry readers. We spent more than half an hour reading "favourite poems" to a group of residents last week and again this week. I was quite apprehensive about this - What poems do you read? How well will they be received? Will they be remembered? I shouldn't have worried. I brought along two collections - the recent Favourite Poems we Learned in School by Thomas F Walsh and The Ideal Book of Poetry selected by Rev J A Kingston CSSp published in 1915. This latter is a collection of 100 poems starting with Shakespeare's Blow, Blow, Thou Winter Wind and ending with A Cradle Song by Colum. Our eclectic selection went down very well. I began with I Remember I Remember by Thomas Hood and included a few Yeats numbers. We had one request from a listener - for I Wandered Lonely as a Cloud by Wordsworth which is in the Ideal Book so request immediately granted. The poem which got the greatest reaction was the one that began: Up the airy Mountain, Down the rushy glen - The Fairies by William Allingham. This gig is going to be a weekly one for the next month or two so many more favourite poems have to be dusted off and read. 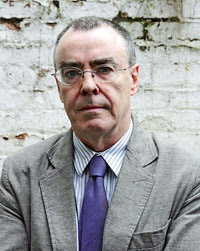 The shortlist for this year’s Irish Times Poetry Now Award for the best single volume of poems published by an Irish poet in 2009 were announced on Saturday. Report here. The shortlisted volumes are Ciaran Carson for On The Night Watch ; Vona Groarke for Spindrift; Sinéad Morrissey for Through the Square Window; Eileán Ní Chuilleanáin for The Sun-fish, and Peter Sirr for The Thing Is. The only one I've read is The Sun-fish which was also short listed for the 2009 T S Eliot Prize for Poetry. Thoughts on the list include wonder at how prolific poet and novelist Ciaran Carson (right) is - he had a collection on last year's shortlist as well - and the fact that all but one on the list are published by Peter Fallon's Gallery Press in Loughcrew in Co Meath - three out of last year's five shortlisted titles were published by the same press. The winner will be presented with €5,000 during the DLR International Poetry Now Festival, which will take place in Dún Laoghaire from March 25th-28th. The website doesn't have this year's programme yet but it's due to be announced any time now. Last year's winner was Derek Mahon for his collection Life on Earth. This year's judges are poet and translator, John F Deane; poet Alan Gillis, and academic and literary critic Maria Johnston. Windows Publications, in association with Cavan Crystal, is pleased to announce the opening of their 18th National Poetry Competition. In addition to cash prizes in each category the winner will be presented with a beautiful and much coveted Cavan Crystal goblet sponsored by Cavan Crystal Design. This year, Windows editors Heather Brett and Noel Monahan are incorporating an adult category into the competition, which they do every three years. The first prize for each of the student categories is €100 or equivalent and in the adult category 1st prize is €500. Entry to this competition is free. Entrant details (name, age, school or contact number) must be clearly marked on the BACK of each entry if posting work or at the end of the work if sending by email. Poems should NOT have been published before or won a prize in any other competition, and must be the student's OWN work. Competition entries will also be accepted online as well as by post. Send entries to heatherbrett22@hotmail.com or by post to Cavan Crystal Hotel, Dublin Rd., Co Cavan clearly stating which category you are entering for. Senior Category- Open to all students aged 13-18 throughout Ireland insecond level education or equivalent. Best Overall Schools - All school entries are automatically entered. The competition is open to all persons in Ireland or elsewhere, over the age of 19 on May 20th 2010 and can only be entered by posting entries to Cavan Crystal/Windows Poetry Competition, Adult Category, Cavan Crystal Hotel Dublin Rd.,Cavan. Details (name, address and contact number) must NOT appear on the poems entered, but must be on a separate sheet. Poems should NOT have been published before or won a prize in any other competition. The entry fee is €10 for each three poems entered. (Please make cheques or postal orders payable to Windows Publications.) It is a condition of this competition that winning poets make themselves available to come and read their work at the Awards Ceremony in Cavan Crystal Hotel on Thursday May 20th 2010 at 8pm. A shortlist of winners will appear by the beginning of May. For any enquiries please ring 0860650908. The results of the Plough Poetry Prize have just been announced and the results and long and short lists are available on the website. There were 2,090 entries in three categories with 1,035 in the open category. One of my entries, Bolton Abbey, Yorkshire (which I rate very highly myself), made the long list of 100 in this category so I feel pleased with that. The same poem has done the rounds of Irish competition without notice. In the two main categories, the fashion for oddly gappy and stepped layouts seems to have waned, and by and large the poems looked pretty good on the page. Some of the cliches of the last few years are fading, but others are taking their place: the filter judges identified 'leaden', 'gentle', 'nudge', 'ebb', 'carress', 'ache' and 'metamorphosis' as over-used among entries. Other problems they encountered included gratuitous line breaks, repetition where none was needed, and prose pretending to be poems ('You can't call it a poem by squashing it up and laying it out differently,' one of them sighed). They longed for more lyricism, rhythm and musicality, and suggested that poets could test this by reading the poem aloud. From the administrative point of view, a depressing number of entries had to be disqualified because they contravened the conditions of entry. It's the same in every contest: the administrator for the National Poetry Competition reckons that about 5-10% of their entrants fail to follow their conditions in some way, and last year that would have meant that the entries of between 500 and 1,000 poets didn't make it as far as the judge. It's hard to understand why anyone would go to all the trouble of writing and entering a poem but not read and follow the rules, but there doesn't seem to be any way of making the process foolproof. On the plus side, far fewer entrants sent under-stamped entries this year. Poems came from all over the world, including Australia, Canada, Finland, France, Germany, Greece, Hong Kong, India, Italy, Luxemburg, New Zealand, Norway, Poland, Romania, The Netherlands and the USA. Among the words most commonly found in titles in the main categories were: dream/s, memory/ies, soldier, fall/falls/falling, home/homecoming, colour/s; the single most popular title was Loss, closely followed by Snowdrop/s - and mysteriously, there were a surprising number of poems involving sheep.